Learn how to apply Functional Programming with Kotlin to real-life projects with popular libraries like funkTionale.Key FeaturesFocus on the functional aspects of Kotlin and identify the advantages that functional programming brings to the table and the associated coding benefits,Implement common functional programming design patterns and techniques.Learn to combine OOP and Reactive Programming with Functional Programming and how RxKotlin and funkTionale can help you implementing Functional Programming in KotlinBook DescriptionFunctional programming makes your application faster, improves performance, and increases your productivity. Kotlin supports many of the popular and advanced functional features of functional languages. 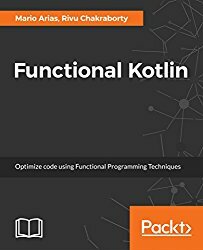 This book will cover the A-Z of functional programming in Kotlin. This book bridges the language gap for Kotlin developers by showing you how to create and consume functional constructs in Kotlin. We also bridge the domain gap by showing how functional constructs can be applied in business scenarios. We’ll take you through lambdas, pattern matching, immutability, and help you develop a deep understanding of the concepts and practices of functional programming. If you want learn to address problems using Recursion, Koltin has support for it as well. You’ll also learn how to use the funKtionale library to perform currying and lazy programming and more. Finally, you’ll learn functional design patterns and techniques that will make you a better programmer.By the end of the book, you will be more confident in your functional programming skills and will be able to apply them while programming in Kotlin.What you will learnLearn the Concepts of Functional Programming with KotlinDiscover the Coroutines in KotlinUncover Using funkTionale pluginLearn Monads, Functiors and ApplicativesCombine Functional Programming with OOP and Reactive ProgrammingUncover Using Monads with funkTionaleDiscover Stream ProcessingWho This Book Is ForKotlin developers who have no functional programming experience, will benefit from this book.About the AuthorMario Arias is a Pivotal Certified Instructor for Core Spring and Enterprise Spring courses.Mario Arias has more than 12 years of experience on JVM languages and related technologies. An active member of the Kotlin community, Mario is the creator of funKTionale, KotlinPrimavera, RxKotlin and contributor of the Spring Framework JDBC Kotlin support. Currently, Mario Arias is working for Cake Solutions Ltd. as a software engineer.Rivu Chakraborty is a Google Certified Associate Android Developer Kotlin Lover, Enthusiast and Evangelist, Sr. Tech. Member of Institution of Engineering (India).With over 5 years of total experience he is presently at MaxMobility Pvt. Ltd. as a Sr. Software Engineer (Android).Rivu Chakraborty is a contributing Member of Google Developers Group – Kolkata, and a Founder-Organizer of Kotlin Kolkata User Group.Writes tutorials on programming at RivuChk, AndroidHive and Java Code Geeks.